Art With Mr. E: Super Site for Savings this Season - Shutterfly! With 803 wonderfully different designs to choose from for the Christmas Season...you will find the perfect complement to your family photos! I've uploaded several different designs/layouts for you to see the variety. Remember though...this is only 1% of the available cards!!!! My personal fav. is the black & white photo with the red/green criss-crossing asymmetrical ribbons! I also like the option of making the images black & white. We have some amazing close up photos from the fall, but Margaret is obviously wearing fall colors. Going black & white with them will allow us to use them for winter as well. It reflects my personal style, but I think my wife will want a more traditional layout. She enjoys more symmetrical designs. The great thing is...with so many options...we'll surely be able to find a blend of our styles. We may also need to consider one of the layouts that will allow us to show off more photos of our beautiful girl!!!!! With family & friends all over the country, this type of card would allow us to share so much more! . I know whatever we decide...the end result will be wonderful. We've so appreciated the quality and service Shutterfly delivers. Also, we've not found a better price for the quality & product!! Margaret is the first grandchild for my wife & I's parents. Pictures of the first/only grandchild are like GOLD!!! ha ha The calendar maker on Shutterfly allowed us to create amazing Christmas presents for the grandparents that would bring great joy all year round. To top it off...IT'S EASY TO USE! All of Shutterfly's services are easy to use!! So if you have someone that is hard to buy for...think about creating a calendar this Christmas. It's a gift that gives the whole year long! For those of you that are coffee/tea drinkers....or know someone who is...why not consider a mug with the favorite mugs in your life!!! If you use Pampers you can cash in some points and get some other stuff for free too!! That is how I am getting so many free prints as well, plus you should get 50 free prints if you are new to them! Enjoy!! Oh and Shutterfly send me an email today giving me 10 more free cards, and in the snail mail came a coupon for free shipping and $10 off....so we will spend we think about $20 on 90 cards and 275 prints. Not a bad days work for me huh?! $50 and change is what we sent to get 45 more folded cards. The sliding sale price only applies to the extra cards you buy, not including the first 50. But mine will be awesome! Dear Anonymous, I'm sorry that you feel I've let my blog slide. 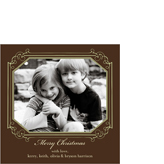 I was a bit iffy about putting the Shutterfly post, but 50 free cards for my family was to good to pass up. They are expensive...and it will allow me to show off my baby to my family that lives 12 hrs away. I'm sorry you dislike that, but I can assure you it will not be happening very often.